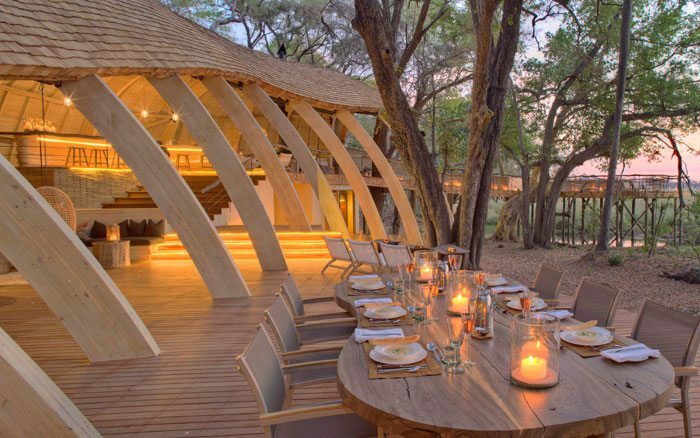 The new Sandibe Safari Lodge opened in September 2014 with a strikingly innovative new design. 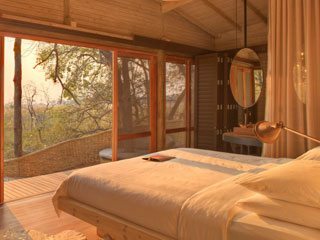 The main lodge was inspired by the smoothly scaled body of the pangolin and the 8 cottages were based on weaverbird nests. 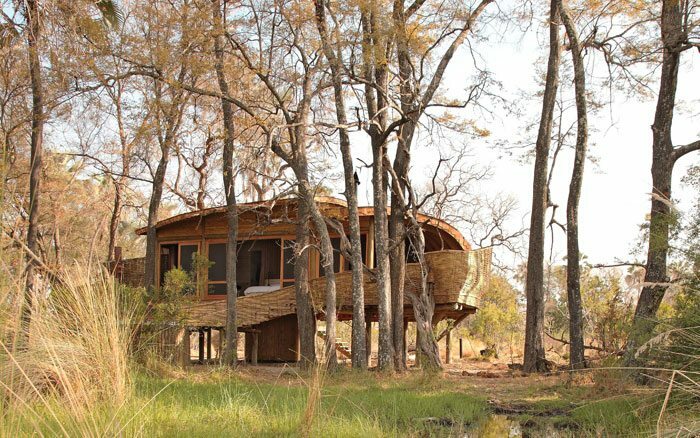 The resulting lodge looks quite unlike any other, with fluid organic curves formed from natural materials such as wood and reed. In our view, it’s a triumph. The main lodge manages to be as open and airy as a cathedral made of pale wood, yet it is elegant and comfortable. The cottage suites successfully combine the cosiness of a nest yet have space and restrained stylishness. 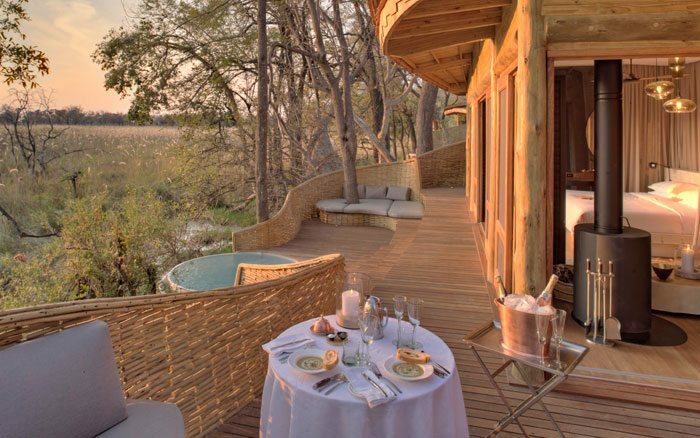 The suites are private cocoons of luxury, built among tall trees and facing the lagoon. 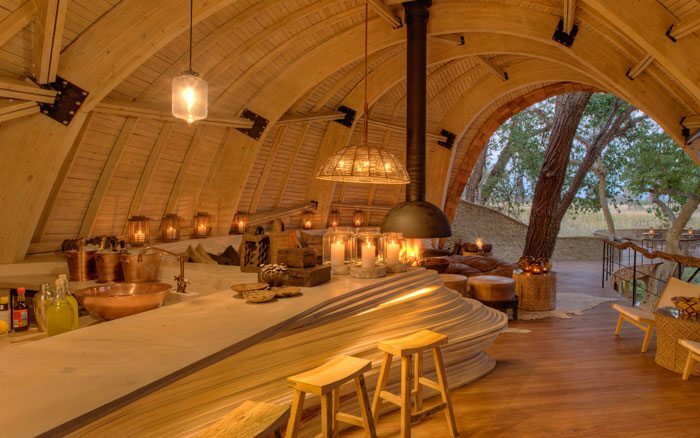 Each has a king-size bed, leather sofa and coffee table created from a tree trunk. Gauze doors can be opened to the sights, sounds and smells of nature, and pulled across for security at night. A fireplace provides heat on chilly evenings. The bathroom is supplemented by an indulgent outdoor shower so you don’t have to miss the views, and your deck has large day beds and a plunge pool. It might be a wrench to leave your luxurious nest, but it will be worth it as you will be treated to superb wildlife viewing in this exclusive, 8000 hectare private concession. Being right next to Moremi, the wildlife here is usually excellent year round. 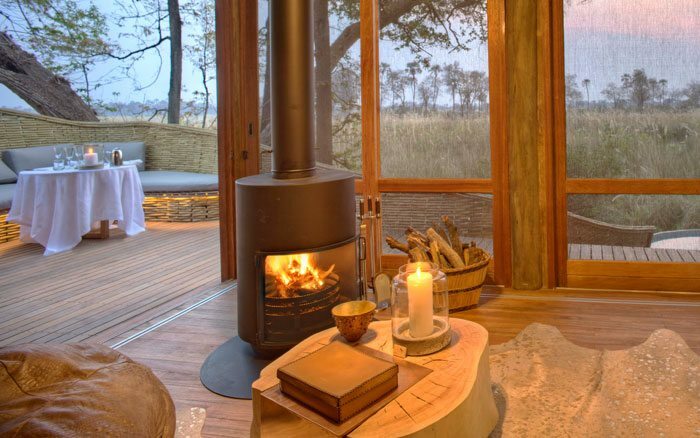 Visiting and resident elephants, big cats and other predators, plains game including red lechwe and sitatunga, and a myriad of bird species (about 450 species) make this concession area one of the top spots in the Delta. 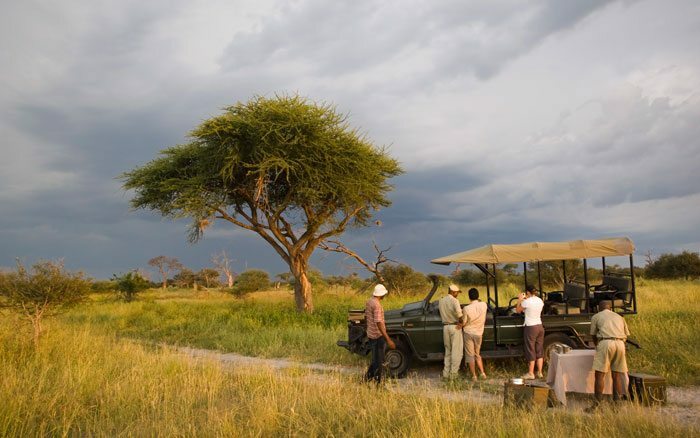 You’ll have 2 game drives a day at Sandibe, one just after sunrise and another in the late afternoon, continuing after dark. 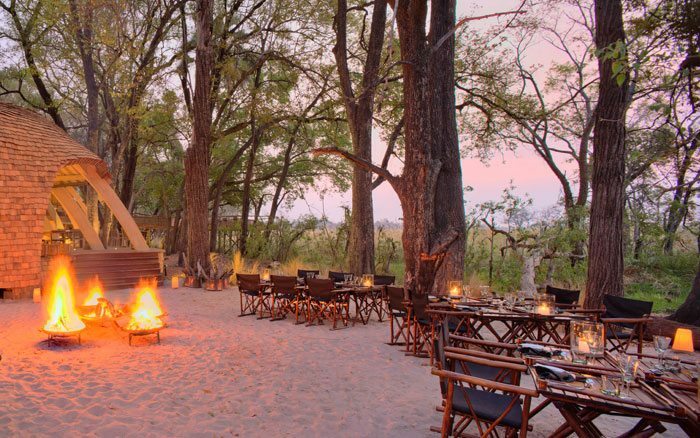 Your expert guide will show you the varied terrain of the Okavango, stopping to watch animals and birds, as you develop an understanding of the natural world. These drives are complimented by guided walks near the lodge, and the opportunity to seek out plants and smaller animals and learn about their role in the environment. Between safaris you’ll be free to unwind, sinking back into a sofa in the lounge, sipping a reviving drink in the bar and chilling on one of the many decks. In the afternoon you might opt for a siesta, or a visit to the massage sala for the treatment of your choice. From the busy interactive kitchen, delicious meals are served under the African skies or at the large table in the splendid dining room. Mealtimes are lively, group affairs, where you’ll have the chance to get to know other guests and share traveller’s tales, though private dining can be arranged. Children of all ages are welcome, although those aged under 6 cannot take part in lodge activities. The minimum age for guided walks is 16. Those aged 12 and over can go on game drives, while those between 6 and 12 are permitted on game drives at the manager’s discretion. There are 10 guest suites (this will rise to 12 later in 2015), set on stilts into trees. They have split-level decks with plunge pools, private salas and large bedrooms, dressing rooms and state-of-the-art bathrooms. The design, like that of the whole lodge, is pleasingly natural and organic, as well as supremely comfortable.